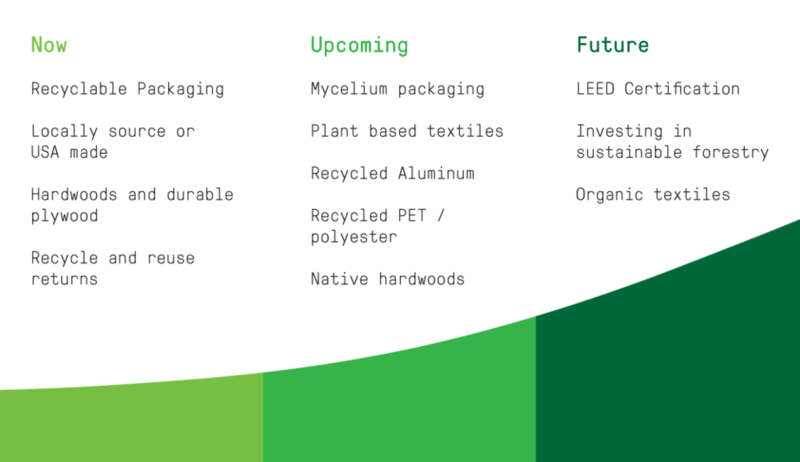 Brief: Develop the Greycork sustainability policy for manufacturing, design, and marketing to guide the launch of future collections. Problem: The Greycork team had been acting on an unofficial sustainability policy that drove the majority of their product decisions, but had not coherently stated it for themselves or the consumer. As they were preparing to ramp up their product offering they needed a clear policy they could rely on when making design and manufacturing decisions, and they needed to be able to clearly articulate this to their customer who shared their values. At Greycork we knew our consumers cared about how their purchases impacted the world. Our main audience was millennial’s living in the largest U.S. cities, and the data showed that there was a strong correlation between social good and brand loyalty. The company thus far had committed to US manufacturing, quality materials, and products that last. Inherently, they were already sustainable, but there was no clear strategy guiding these practices other than the founders own personal mission and no clear policy to convey this to the consumer. We knew that the clearer our internal and external messaging could be the more good we would do for the planet, and would also increase our brand loyalty. Sustainability is difficult. The world we live in is complicated, and the web of interconnections that are established in any manufacturing process make it difficult to determine the exact impact a product may have on our Eco-system. To think sustainably as a designer involves thinking of the full life cycle of a product from cradle to grave. A couple factors are incredibly important to any green design. Durability: Our core millennial consumer moves consistently. The durability of our product means that we can overcome the move and dump cycle by offering products that last, and maintain their aesthetic value. Longevity: Timeless designs inherently extend the longevity of products and maintain the desire for an object over time. This pushes back on the short term consumer market, and means consumers invest in long term product choices. Recyclability: In the new product line, our ability to use recycled materials, or materials that can be up-cycled into new products, means we will drastically lower the carbon footprint, and be a leader in the furniture market. Biodegradability: Using all natural materials with natural finishes and established end-of-life practices means no matter the life cycle of our products we will have minimal waste impact. Informed by rigorous research into academic, industry leading, and competitor standards we devised a system for identifying the right materials for upcoming collections. This involved creating our own complex rating system based on the three principles of sustainability, feasibility, and location that aligned with our operational, budgetary, and mission driven goals. Once we had chosen our top materials I investigated manufacturers with the capability and price point that aligned with our goals. Through this process I was able to identify key manufacturers within the US and Canada with the right sourcing, quality, turn around times, and distribution networks that matched our sustainable policy. Sustainability already played an inherent role in the decisions Greycork made, and armed with the research from this project they were able to strategically identify next steps for growth with solid contextual backing. From the project several partnerships with manufacturers were established that met their future goals, and a cradle-to-cradle mindset was established within the design team. In addition the information provided by the final report was integrated into marketing materials across platforms. It not only confirmed the beliefs guiding the company, but also outlined clear pathways to becoming a leader in the sustainable furniture market.